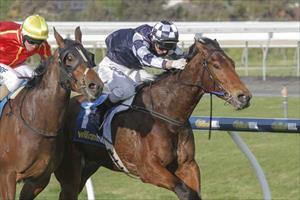 Victorian raider Bullpit had to pull out all stops to record a strong first-up victory at Morphettville on Saturday. "It was an impressive win given he was carrying 60kg, but I loved how the horse kept fighting all the way to the line," Neilson said. Bullpit and well-backed local Brooklyn had a battle the length of the straight that ended with a head-bobbing finish. "We had to drive through to hold the lead from barrier 1 and there was quite a bit of pressure up front, which is what made his effort even greater," he said. Neilson is quickly becoming owner Steve Pitts' favourite jockey as the hoop also won aboard Zahspeed in July for the owner. Trainer Danny O'Brien said there was plenty of merit in the win and is looking forward to a strong four-year-old season from the son of Speed 'N' Power.